Massachusetts to Minnesota (4): heading west through NY, PA, OH, KY and IN, then on to MN | A balanced diet . . .
Leaving Niagara Falls via the Niagara Scenic Parkway on the Sunday morning, we headed south, skirting Buffalo and the eastern shore of Lake Erie towards Pennsylvania, and the Allegheny National Forest. Our destination was Canton in Ohio, just south of Akron, a journey of 313 miles. Along the Niagara Scenic Byway, there are two impressive bridges across the Niagara River on I-190. There was little traffic around Buffalo, fortunately, even though it was a fine morning for Father’s Day. Soon enough we were outside the city limits and heading south into Pennsylvania. Pennsylvania was a ‘new’ state for us (as were OH and IN), and I particularly wanted to travel through the Allegheny National Forest. We travel on the interstates as little as possible, taking US highways and county roads in preference. You get to see a lot more of rural America that way. But roads are none too wide with few places to stop. And certainly no easy stops for photography. So on these two days we have little to show, photographic-wise, for our long days on the road. The next morning we had an early start as we decided to cover the whole route that I’d planned, some 447 miles south through Ohio, crossing the Ohio River into Kentucky, before crossing the river again further west into Indiana to reach our next destination, Bloomington. The drive through OH took us through some delightful towns and villages, and productive agricultural landscapes. Although we saw road signs to be aware of Amish buggies on the road, we only saw a couple. Somerset is a small town about 110 miles south of Canton. In the middle of its impressive town square (which had a very English feel to it) there was a statue to a famous son of Somerset, Union General Phil Sheridan. 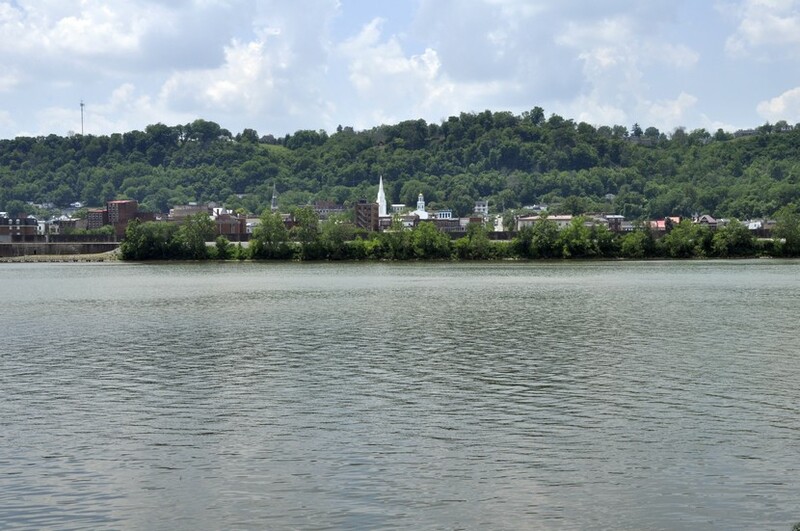 We also passed by Dover OH, home to infamous Confederate guerilla leader William Clarke Quantrill (I just bought a biography to read), and also Bainbridge, home to the first dental school in the USA, opened in 1825. Eventually we reached the Ohio River at Aberdeen OH. The Ohio is a very impressive river and as I commented in a post after last year’s road trip, its flow is greater than the Mississippi. No wonder that rivers like the Ohio were used to open up the interior of the country. This is the bridge that carries US68 into Kentucky. We crossed a little further west on the William H Harsha Bridge, carrying US62. 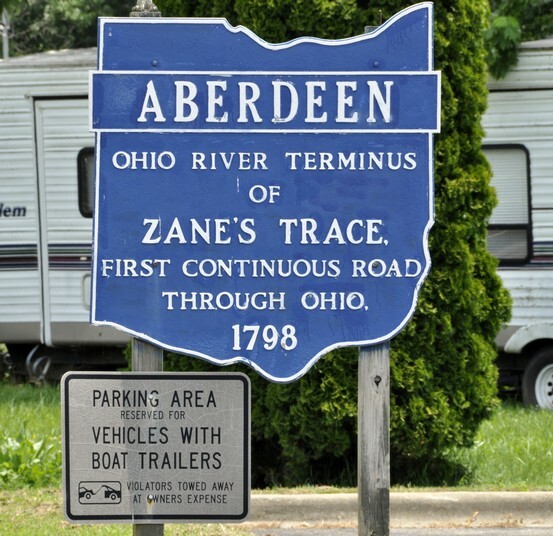 Aberdeen is also the terminus of Zane’s Trace, the first continuous road through Ohio, from 1798. Crossing into northern Kentucky, we were less than 50 miles north of where we had driven through the state in 2017. Then it was over the Ohio again, and into southeast Indiana. Our good friend and former IRRI colleague Bill Hardy (a native born Hoosier) told us that we should see the southern part of the state, since the northern half was flat and rather uninteresting, maize upon mile of maize. He was right. The drive into Bloomington was delightful in the early evening sunshine, with Highway 46 weaving through the trees, up and down dale. After a restful night in Bloomington (yet another Comfort Inn!) we set off the next day for the penultimate sector of our trip that would take us to Ludington on Lake Michigan in the state of that name. This was another long drive, over 400 miles, north to Gary IN, and then wending our way north along the eastern shore of the lake. Just over the state line into Michigan we stopped to have a quick picnic lunch at a rest area (and Michigan information center) on I-94. We were very impressed with the amount of tourist literature and maps available at the information center; Michigan certainly knows how to sell itself. Just north of the state line we took a short detour to Warren Dunes State Park. Lake Michigan is like a vast internal sea, and along its shores, certainly the eastern shore, there are huge sand dunes, now covered with mature woodland. The sand is extremely soft, and hard to walk across. Just like being at the seaside, and although the day was overcast, enough brave souls were enjoying beach to the maximum. This is Tower Hill Dune that rises to more than 230 feet above Lake Michigan. Then it was back on the road again, heading for our last night stop of the trip, at Ludington, before taking the ferry across Lake Michigan the next morning to Manitowoc on the Wisconsin shore. 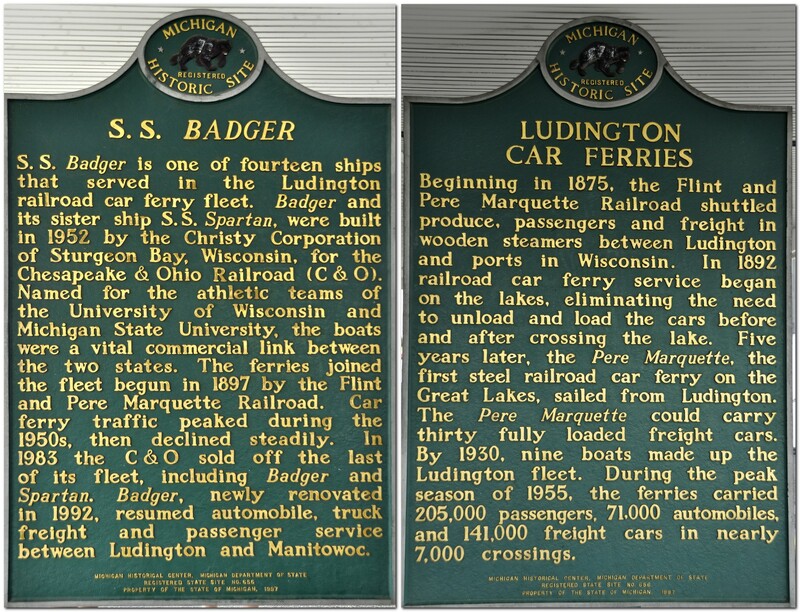 The ferry, SS Badger, across Lake Michigan is operated by LMC – Lake Michigan Carferry. 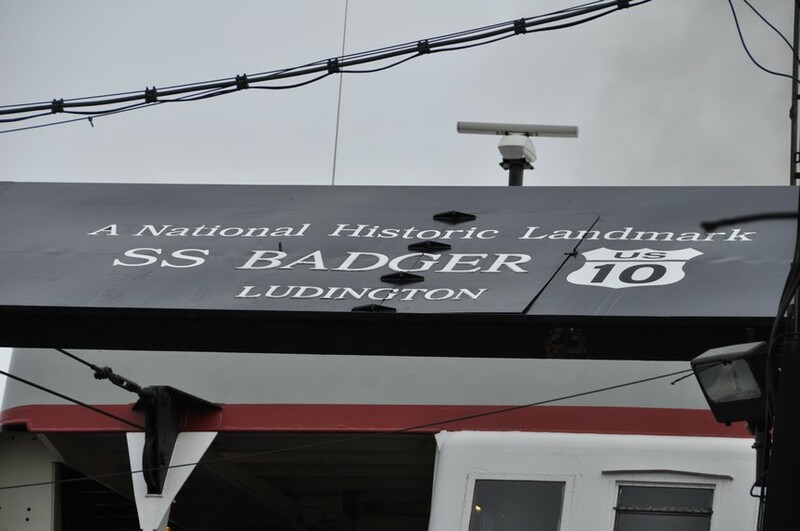 Badger is the last coal-fired ferry operating in the world. It is 393 feet long, and has a beam of almost 60 feet. It was built in 1953 in Sturgeon Bay, WI. 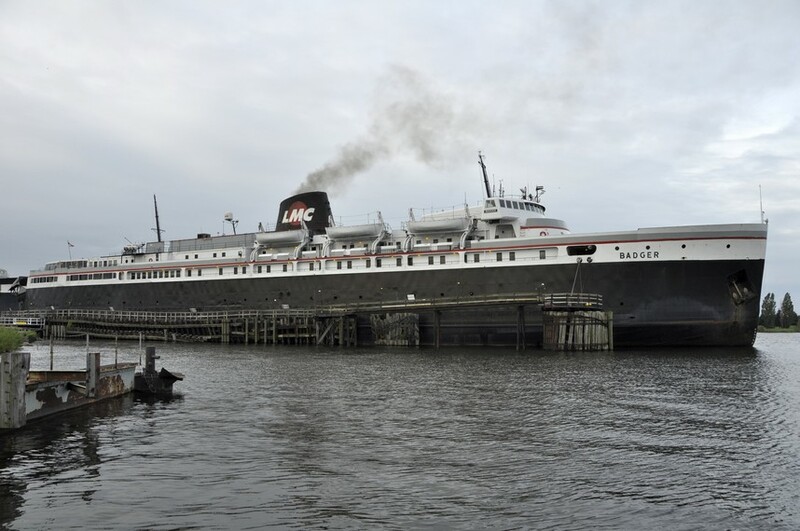 Its sister ship, Spartan, has been laid up in Ludington for many years. Originally the ferries carried rail cars. The 60 mile crossing of the lake takes four hours, but you gain 1 hour moving from Eastern Standard Time to Central Time. As it was a Wednesday in mid-June, before the height of the tourist season, the boat was far from busy. The slow, easy-paced crossing was just my opportunity to catch up on some sleep, in readiness for the final push into the Twin Cities from Manitowoc across Wisconsin, some 321 miles. We were at the dockside a little after 07:30, and they started to board the vehicles shortly afterwards for an on-time departure from Ludington at 09:00. Vehicles are driven on board by company staff. So before we sailed we had a good look around the vessel. Soon enough we were headed out of Ludington harbor. And before we knew it, Manitowoc was coming into view, and everyone was getting ready to disembark. I had planned a route across Wisconsin that took us from Manitowoc through Stevens Point on US10. We took I-43 north for a couple of miles or so, then came off to take US10, only to see a sign stating that the road was closed some miles ahead. With that, I changed the settings on my satnav to take the quickest route to St Paul, rejoining I-43 around Green Bay, and west on Highway 29, until we joined I-94 west of Chippewa Falls for the final 75 miles into the Twin Cities. Highway 29 was a nightmare. Although a dual carriageway (a divided highway) it just went on and on, unrelentingly, in a straight line across Wisconsin. However, we did arrive to Hannah and Michael’s almost an hour earlier than anticipated. Thus ended our 2018 road trip across twelve states: MA, VT, NH, ME, NY, PA, OH, KY, IN, MI, WI, and MN. In nine days we covered 2741 miles, plus another 477 miles in Maine itself during the six days we stayed at the cabin. We used 133 gallons of gasoline, at a cost of $384 ($2.89/gallon, less than half of what we would have to pay in the UK for the same amount of fuel), at an average consumption of 24.19 mpg. I’m already planning for 2019; Georgia to Texas through the southern states seems a distinct possibility. This entry was posted in Out and about, Travel and tagged Allegheny National Forest, Indiana, Kentucky, Lake Michigan, Minnesota, New York, Ohio, Ohio River, Pennsylvania, SS Badger, travel, USA.